In the lead up to the new season of Game of Thrones, one Dubai bakery has been commissioned to make a AED 92,000 cake, inspired by the popular television show. In the lead up to the season seven premiere of the popular TV series, Game of Thrones (GoT), a UAE bakery has created a cake inspired by the show. Touted as the world’s most expensive cake – costing AED 100,000 – the GoT design is made entirely of sugar paste and sugar fondant. The cake, which focuses on lead character Tyrion Lannister, weighs in at a huge 32kg, and stands at four feet high. 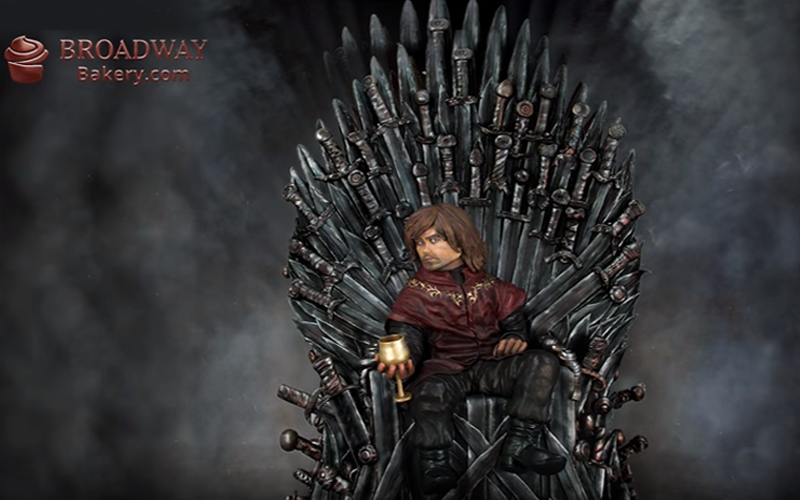 The design includes incredibly intricate detail, including a regal red jacket, a realistic-looking iron throne and Tyrion’s favourite grape goblet. Each section of the cake was made independently, taking three weeks in total, while the cake inside is chocolate flavour. The impressive detail includes stubble on the figurine’s face and a scar (which the character got in the ‘Battle of Blackwater’ in season two). Broadway Bakery, the company behind the design said that although this cake had been sold, similar ones can be built-to-order across the UAE. For more information visit Broadwaybakery.com. Season seven of Game of Thrones premieres on OSN on 17th July 2017.